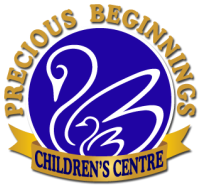 Precious Beginnings Children’s Centre is a Montessori Daycare that enriches children with an abundant curriculum in an environment that enables them to fully develop their potential. Precious Beginnings is based on the educational philosophy and academic approach of Dr. Maria Montessori. We provided childcare / daycare services for children ranging from 6 months* to 6 years of age. We offer a 5 full day program per week for Infants. We offer a 2 to 5 full day program per week for Toddlers and for Preschoolers/Casa children. Precious Beginnings opens at 7:00 am and closes at 6:00 pm. Children can arrive and be picked up at any time during 7:00 am and 6:00 pm. However, in order for your child to benefit from our educational programming, we ask that all children be in their classrooms between the times of 9:00 am to 4:00 pm. Precious Beginnings is open all year round, but will be closed for all statutory holidays (except for Easter Monday). The Centre will close earlier on Christmas Eve and New Years Eve (days / times to be determined). *If care is required for a child younger than 6 months, it may be accommodated... please contact us for more information. +May be closed due to demand.